Sephora can get a bad rap for being kind of pricey, but did you know that you can actually find a lot of things there for $20 or under?! In addition, there are also smaller and travel size products that are perfect for trying out products, products you use sparingly, or for travel. 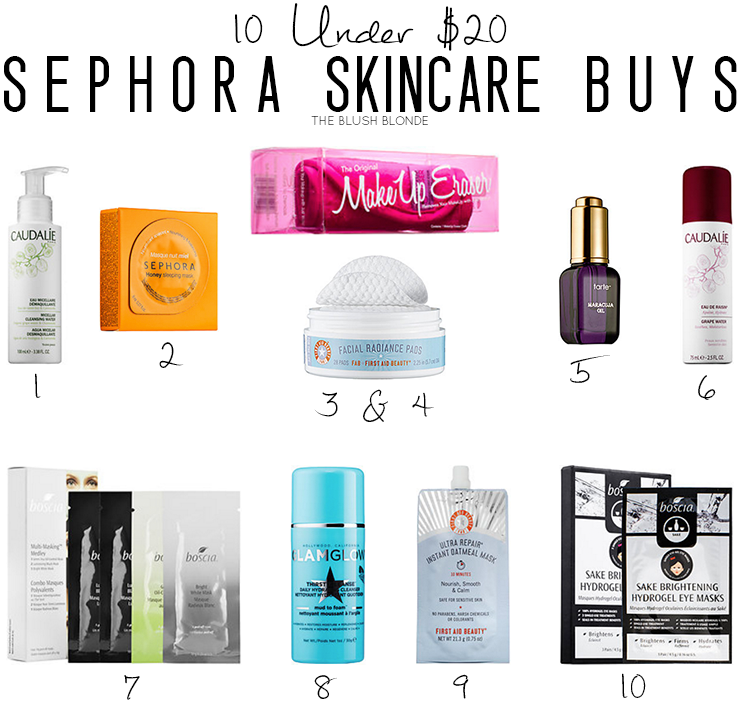 Read below to see my ten picks for skincare products from Sephora that will cost you $20 or less! I am a huge fan of using micellar water to clean my face and actually use it every morning. I haven't tried this one by Caudalíe yet, but it is on my list of products to try. This high end micellar water will help you to make sure your face is free of makeup, dirt, and oil. It also has a yummy scent of orange and lemon blossom, watermelon, and mint leaves. This past winter I became obsessed with sleeping masks because of my super dry skin. This was actually the first sleeping mask that I tried and the one that sparked my obsession. I've tried both the Honey and Lotus masks and loved both of them. The Honey one was my absolute favorite though because I felt like it truly helped my dry skin and made it feel nourished. These are a must try, especially because you cannot beat the price. This makeup removing cloth has been getting rave reviews all over the blogosphere because of its ability to remove makeup with only warm water. It will remove even the most stubborn of makeup without using chemicals and lasts for one thousand washes (which if you were to use and wash it once everyday is almost three years of use). For just $20.00 you will be able to stop purchasing makeup removing wipes, makeup remover, or whatever else you use to take off your makeup for almost three years, which will save you a lot of money. I talked about these little miracle workers a few weeks back because they are my newest skincare love. Like I said in that post they are one of the best skincare products I have ever used and I don't say this lightly. They use lactic and glycolic acids to gently exfoliate skin and are safe for everyday use. After a only a few days of using these my skin has looked the best it ever has - my pores are smaller, blackheads are gone, and my skin literally glows. I've recently been looking around for a new facial oil and plan on trying this one. Maracuja oil is known to moisturize and replenish skin, without leaving it looking or feeling greasy. My favorite part of it though is the added vitamin C, which helps to brighten skin, even tone, and provide antioxidants to the skin. In addition to all of these great benefits one of my favorite beauty bloggers called this a "Holy Grail" product in this post. Mists like this one from Caudalíe are a great way to refresh and hydrate your skin throughout the day. This mist contains water that is extracted directly from grapes in Bordeaux and will not only moisturize your skin, but reduce sensitivity as well. Use as a moisturising toner or as a refreshing mist to help soothe and hydrate your skin. This set includes four single use, peel off masks. These masks will help to brighten, mattify, and purify skin. This set is perfect to use in the summer to achieve a flawless complexion. This cleanser does an amazing job of cleaning skin without drying it out. It goes from Mud to Foam to gently cleanse skin. I've been using this (in the 1 oz size) for a few months now and it has really helped with my dry skin and to prevent breakouts. I especially love using this with my Clarisonic Mia 3 to get a really deep clean. This mask takes just ten minutes to transform dry and dehydrated skin. It uses a mix of oats to comfort and repair your skin, which is important for anyone experiencing any dryness. It works so well that it won an Allure Best of Beauty Award, which says a lot to me. Lately I've been loving eye sheet masks to brighten and depuff my eyes. I recently tried boscia Sake Brightening Hydrogel Mask (a full sheet mask) and I loved it because it made my skin glow. These eye masks are infused with sake, antioxidants, and plant extracts to brighten, firm, hydrate, and reduce fine lines around the eyes. I had such great results with the sheet mask version of these that I cannot wait to try them! What do you buy at Sephora for $20 or under? Hi, Kristin! This is a great round-up of products! I'm a huge fan of a few Caudalie products, but I've yet to try the cleansing water, too! It's on my list, too! So obsessed with Sephora, great list! I can't even go down the travel/impulse area to check out without grabbing anything! I am always overwhelmed by Sephora since they offer so much. Thanks for sharing this list!